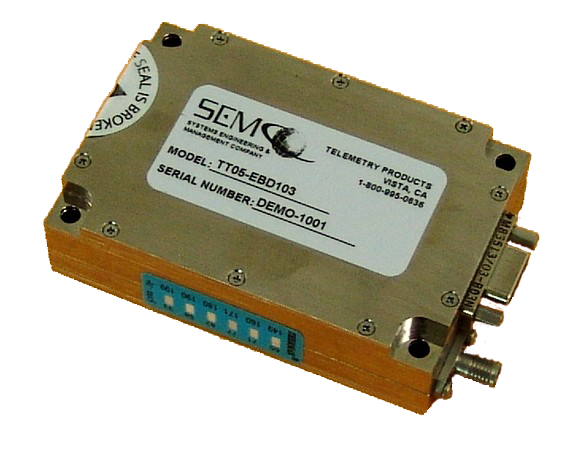 The TT05 is a multi-mode digital telemetry transmitter that is ideal for airborne and other transmitter applications requiring support of legacy PCM/FM modulation modes as well as the more spectrum-efficient ARTM Tier I SOQPSK-TG and Tier II Multi-h CPM. The transmitter design combines small size (5 cubic inches) with excellent size to output power ratios. Programmable in 0.25, .5 and 1 MHz steps, the transmitter provides for frequency agility in lower and upper L-band as well as S-band. It is DC-Coupled for optimum performance; with an efficient maximum power draw of 900 mA (5W) and 1.3 A (10W) at 28 VDC.